Tools > Audio Device Settings. Speaker - Select Play , and drag the slider to adjust the volume. Microphone - Speak to test the volume, and drag the slider until the progress bar reaches the middle of the test area. Ringer - Select Play , and drag the slider to adjust the volume. 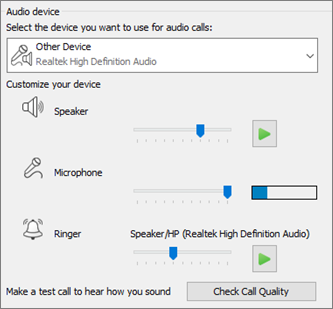 Adjust the audio settings and select OK.
Tools > Video Device Settings. Below Video device, select the camera you want. Adjust the camera angle to center your image in the preview pane. Select Camera Settings if you want to adjust the video processor or camera controls. 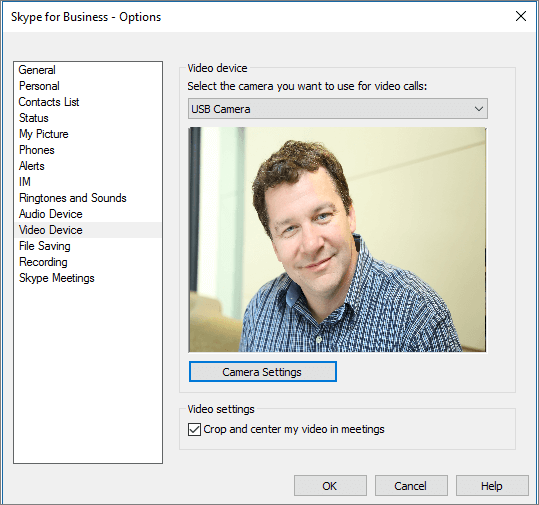 Select Crop and center my video in meetings to focus and zoom in on your face during video conferences.